Ang Thong Marine Park is a protected area of more than 100 square kilometers of land and sea. The pristine archipelago of 42 islands in the Gulf is a fantasy come true to explore with towering limestone mountains, thick jungle, white-sand beaches, fertile mangroves, waterfalls and hidden coves and lakes with a rich variety of exotic wildlife and sea creatures. Snorkeling, hiking, sea kayaking, diving, sailing and simply relaxing on one of its idyllic beaches are activities to be enjoyed at the marine park and at the stunning islands along the way. Superyachts discovering Koh Samui will find an island with an interesting background. The island has gone through some of the biggest changes in its entire recorded history in recent years, transformed from a traditional sleepy fishermen and backpacker island into a full-on global and jet set island destination. Yachting visitors will find a variety and range of facilities and services which constantly expands and already includes everything from full servicing for Superyachts to internationally recognized luxury shops and an incredible selection of gourmet dining, 5-Star resorts and internationally acclaimed Spas. 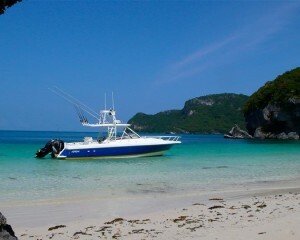 Siamese Dream The Perfect Koh Samui Cruising yacht! This powerful yacht is in perfect condition with rebuilt 275 HP Engines and a top speed of 38 Knots Many extras. Also for Charter! 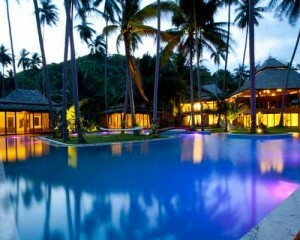 7 to 14 rooms Private Luxury Villa Stunningly beautiful Villa Kalyana is an exclusive beachfront estate on a private bay on Koh Samui. The natural design of this 5 to 10-bedroom residence accommodate up to 18 adults plus and 4 children.